An ode/ramble/prayer for a united family. 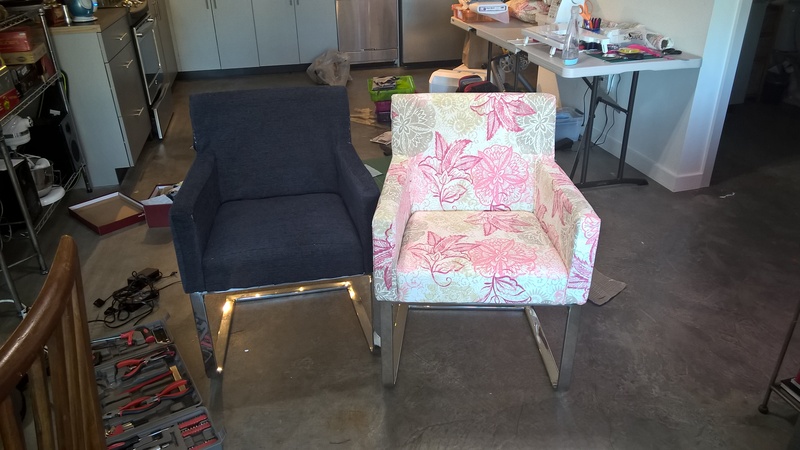 First and foremost, I reupholstered two chairs and I’m really damn proud of myself. I learned a lot about the craft, have taken notes for what to do differently next time. I’m actually looking forward to another opportunity to remake something old and turn it in to something new and improved. I had originally intended to cover both in the floral fabric, but after completing the first one wanted to go for a second look so I could evaluate it — something similar to the electric blue club chairs my grandmother had which I still dream about owning to this day. Now, this isn’t just tuck and staple construction — all of that fabric is sewn together in to a single piece and in the case of the floral print, you’ll notice that the patterns match across the seems. I was going to write a longer post about the nature of relationships but this is all I have tonight. So that brings me to this. I met a cute guy at the park this morning. We met on the spot, connected, and then I learn he has a boyfriend after we had breakfast. At least there is a good friendship there perhaps but just really sick of roadblocks.